We are delighted to welcome you to Medical Center Eye Clinic. We strive to provide the finest eye care available in Salem, Oregon. 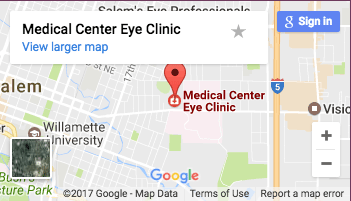 We want to be your eye care center in Salem, Oregon that offers the most comprehensive care possible. To better assist us in meeting your individual eye care needs, we ask that you please take the time to print and complete all required patient forms below prior to your first visit with your eye physician. By completing these forms prior to your arrival, we can better ensure that your appointment starts on time and that the expectations for your visit are met. In an effort to establish accurate insurance billing records, please bring insurance cards pertaining to the appropriate patient with you to your appointment. If you have any questions about insurance billing, appointment times, or policy coverage, please contact our office to speak with a bookkeeper for assistance at 503-581-5287 or Upload Records Here.